RancherMan’s quite the accomplished hunter. As such, we always have a freezer stocked full of pork roasts and I enjoy finding different ways to cook them. I often use my slow cooker to prepare those roasts. Most of the time I’ll flavor it very generically so I can remake the leftover cooked meat into whatever we’re in the mood for. I’ve made Carnitas Tacos, or Pulled-Pork Enchiladas, or even BBQ Sandwiches & more. But today I’m in the mood for an Italian-style roast with diced tomatoes, chunky onions, crushed garlic & minced fresh herbs. 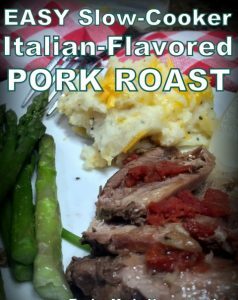 I looked around the internet for inspiration for an Italian-flavored roast, but they all had too many steps for me. And too many ingredients too. I’m a lazy eerrrrrrrr, I mean busy cook! Since this slow cooker is large and my roasts were relatively small I decided to go ahead & fill it up. I’m a Cook-Once, Eat-Twice kinda cook ya know. So I thawed & rinsed 3 small pork shoulder roasts (I’m guessing about 5-6 lbs total) and crammed them into my slow cooker. Then I added a can of Italian-seasoned diced tomatoes. I sprinkled 1/2 teaspoon each of salt & pepper evenly over the roast & some Worcestershire sauce too. Finally I added some fresh minced oregano & thyme (or you could just use a couple of teaspoons of dried Italian-flavored herbs if you like) and sprinkled the pressed garlic over the top. Finally I chunked a large onion into thick wedges and tucked it around the roast. In only a few minutes the prep portion of my meal was done. I turned the slow cooker on low and just walked away. Now that’s my kinda cooking! I prefer my cooked temps on these wild-pork roasts to be 160 degrees. So I cooked it for about 7 hours and that seemed to be about right. It was a cold day with a rare cold front bringing temps into the low 30’s. So this meal cooking all by itself as RancherMan & I tended our chores was a welcome thing indeed. Who wants to come in from a hard day at work and start cooking supper? I simply walked into the house after a long day of work to the delightful smell of homemade roast. I whipped up some mashed potatoes and steamed up a few spears of fresh asparagus from the garden and our homemade supper was done! Who said homemade cooking had to be hard or time consuming?? Simple, hands-off and delicious. Give it a try! 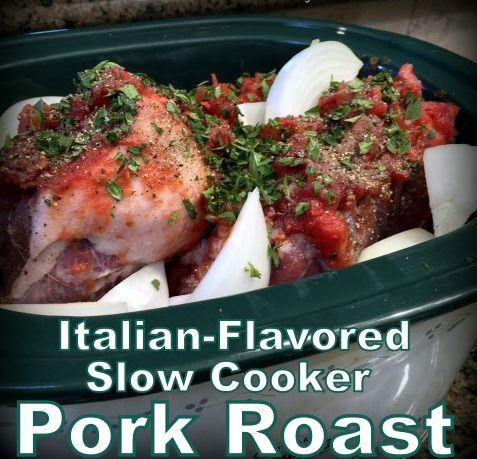 Place roast in slow cooker & pour diced tomatoes over roast. Sprinkle Worcestershire sauce evenly over top of roast. Sprinkle salt, pepper & seasoning evenly over top of roast. Press garlic & sprinkle over roast. Add wedges of onion evenly around roast. 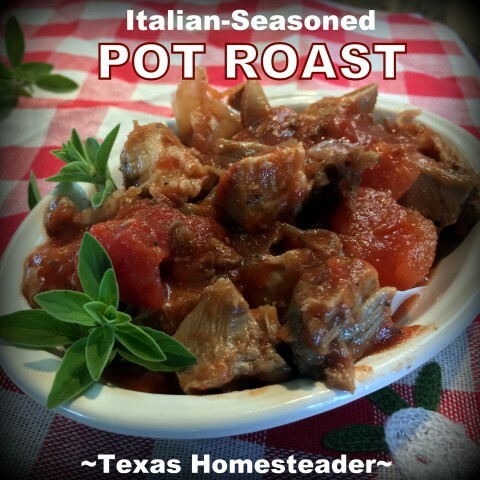 This entry was posted in Blog Posts and tagged Cooking, Recipes on April 15, 2018 by Texas Homesteader. “The slow cooker is proof that God loves us and want us to be happy.” Benjamin Franklin Looks great, will try as soon as I get some more garlic! I love cooking that way, as well. And I’m with you, I just throw everything in, turn it on and go. I made sure my kids had all the usual stuff, pots and pans, dishes, but I also included a crock pot, when they left home. Your recipe sounds good!